Getting a job is not only a matter of improving your economical condition rather it is a challenge for many people who want to establish themselves as an individual. 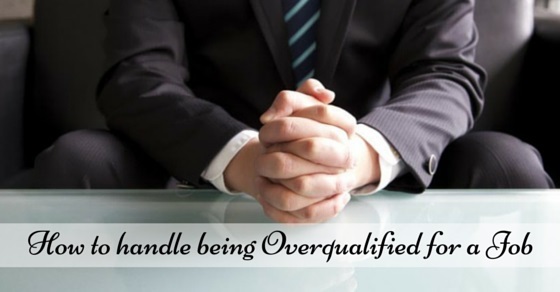 Generally we believe that being highly qualified is the only means to get a job. But stop and think, is that a truth? At some degree and from a plain view it may seem quite right but this is not the whole truth. There is something more. There could be different reasons why you might leave your previous highly paid job. You may have found the current applied job is more related to your aims or you are comfortable with or something else or your previous job may be too much hectic for yourself. The reason may vary and depend on the situations and time. The only thing you should do that you have to stay honest with yourself, with the company you are applying for. Remember, honesty is always the best policy at the end of the day. Pay more focus on the skills and accomplishments. The selector will look into your application in search of the criteria which matches to the job and not your extra qualifications. Try to keep the application form full with basic information about your skills and how better you can handle the odds at the time of crisis. Let your application speak about you. Tell your recruiters how they can be benefited by hiring you. Tell them about your schemes and plans for the economical beneficial sides. Every private company looks for such employees who have the passion for improving the financial background on their behalf. Showcasing of current knowledge and cut edge sense of responsibility always work on the behalf of the applicants. Never feel shy to deliver your best while you are being asked something regarding your knowledge of current affairs. Having profound knowledge in something is no longer in use. Instead, recruiters eye for those candidates who have superficial knowledge in everything. Showcase your interest and admiration for the job you have applied for. Believe it or not, there is nothing like this. It is the easiest way to win over the heart of the interviewers. You being excessively qualified for the post you are applying for, may lead the interviewer throw the application form right into the trash box. And the reason behind such action will be that you are appearing too self involved rather than interested in the job. There is an ulterior thing that has not still come in to the view of the thousands of millions job seekers. When you are applying for a job to a company, be it a small private firm or a large industry with thousands of workers working there for years, each kind of company aims at recruiting who have more self confidence to learn than more qualification to be proud of. When the applicant is someone with more qualification than required, it causes a rise of cascade of question in the mind of the interviewers in the regard of the purpose for the application. Someone who has already passed the level will definitely not like to pass the same freshers experience again. If you apply for a post you are too qualified for, you may be rejected in the first place at the time of selection or if you succeed making it to the interview room you may be asked the same question like why have you applied for the job much less worthy of your qualification. So be prepared at prior to the interview or the better will be if you mention less of your qualification in the application form. Being unnecessary savant may not only be the cause for you being labeled as an overqualified for a position in a company. The other cause is that your fatty salary in the last company you have worked in for years. The management board for a company may feel it a bit weird that someone who has enjoyed a secured position and a fatty salary at the end of the month applied at a company that is unable to feed its employees with such a high salary. It is always very preferable not to mention about your salary. You may be asked about it at the time of the interview and the best thing will be not to boast about it. Working experience is always counted as a good and demanding qualification. But it can create a type of trouble while you are planning for applying to a new job. When someone is applying for a job that is worthy of the status of the applicant, it always makes the applicant and the application a matter of suspension to the management board. Do not live in the imagination that your years of experience will catch the mind of the interviewer and the rest of the management board, rather, beyond your expectation; it can pose a serious threat. Do not leave the impression that you are trying to apply for the job because you want to pass your time, or you want to experience something new beyond your knowledge. You should maintain the impression that you desperately need the job and it can solve all of your problems. If it is a small firm then you must try to be involved with dedication. Small firms always prefer to recruit people with more dedication rather than their educational or professional qualification. Then comes another significant point to discussion and that is what to do after you are selected for the job you have applied for. The first thing that will be considered at the first day of your job is whether or not you are sincere and polite enough for cooperation. Try to focus on the job and the training. Do not brag about what you have learnt in your schools and colleges and at your university, remember your educational qualification matters not so much in your professional life. Private firms have a craving to have those in their working place who are more to learn new things at work than those with more educational certificate. Show the talent of being cooperative with other members of the company. At the beginning it may seem to appear a bigger challenge to handle but when you once win the heart of others you know there are no more obstacles in your path. Those are the some specific points to note when you are over qualified for the job you have applied for. You are the one who can make everything alright and fine with your dedication and skill to handle a situation.